Riffle: McCain - Gambling with the U.S. 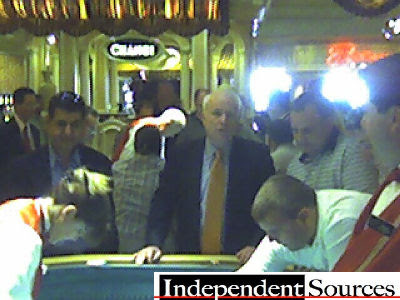 Apparently John McCain repeatedly goes on gambling binges, playing craps for hours at a time. He's also very superstitious. How much money has he lost gambling in Las Vegas and elsewhere? I wonder if he'd be in the gambler's poorhouse if his wife weren't giving him a gambling allowance. UPDATE: The Jed Report has more information on McCain's friend Wes Gullet, who would roll craps with him in Vegas for 14-hour stretches. And who is a lobbyist. And a lobbyist whose clients benefitted from land-swap legislation McCain initially opposed. But, after Gullet's lobbying, McCain changed his position on the land-swap. Love that description of McCain as an "avid gambler." So descriptive and yet non-judgmental. Well, at least he plays dice and not the slot machines, like that wussy Bill Bennett. I'd much prefer it if he was a serious bridge or poker player. Now that takes brains.